[Monday, October 2, 2006] Northrop Grumman Corporation today completed its inaugural Weightless Flights of Discovery program by turning the well-organized, gravity-driven worlds of approximately 40 distinguished teachers from the greater D.C. area upside down - literally. [Tuesday, October 3, 2006] The Boeing Company today confirmed that the Federal Trade Commission (FTC) has granted anti-trust clearance to proceed toward closure of the United Launch Alliance (ULA) joint venture. [Tuesday, October 3, 2006] Lockheed Martin today confirmed that United Launch Alliance, L.L.C. (ULA), its joint venture with the Boeing Co., had received anti-trust clearance from the Federal Trade Commission (FTC). [Tuesday, October 3, 2006] The Spaceward Foundation in collaboration with NASA today announced a significant expansion of the Power Beaming and Tether Challenges. These two events are collectively known as the Space Elevator Games. [Wednesday, October 4, 2006] The Federal Trade Commission today announced its decision to intervene in the formation of United Launch Alliance, L.L.C. (ULA), a proposed joint venture between The Boeing Company and Lockheed Martin Corporation. [Wednesday, October 4, 2006] NASA has selected 120 proposals for negotiation of phase 2 contract awards in the SBIR program. The selected projects have a total value of approximately $72 million. The contracts will be awarded to 103 small high technology firms in 27 states. 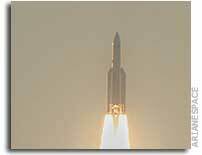 [Wednesday, October 4, 2006] NASA is extending a previous contract action with ATK Thiokol of Brigham City, Utah, to continue design and development of the first stage for the Ares I crew launch vehicle. The extension has a maximum value of $35 million. [Tuesday, October 10, 2006] In considering manned lunar missions, CBO explored alternatives that would use existing launch vehicles; those that would require minor modifications to the designs of existing launchers); as well as new and much more capable launchers. [Wednesday, October 11, 2006] The Northrop Grumman Lunar Lander Challenge will be staged for the first time on Oct. 20-21 at the Las Cruces International Airport, Las Cruces, N.M. as part of the Wirefly X PRIZE Cup space exposition. [Wednesday, October 11, 2006] Media are invited to an Exploration Media Day at Glenn Research Center on Wednesday, Oct. 18. Reporters will have the opportunity to tour facilities, see hardware being built, observe test demonstrations and pose questions to NASA exploration managers. [Wednesday, October 11, 2006] Lockheed Martin Corporation's shares of ILS International Launch Services Inc. were transferred today to Space Transport Inc. The sale was announced on Sept. 7, 2006. [Friday, October 13, 2006] Arianespace has placed two satellites into geostationary transfer orbit: DIRECTV 9S and OPTUS D1. The Ariane 5 ECA launcher was also fitted with the ASAP 5 platform, allowing it to deploy the LDREX-2 experimental reflector for JAXA. [Thursday, October 19, 2006] The Extreme Ultraviolet Imager (EUVI) instrument will soon begin returning stereo images of the Sun's corona as part of NASA's Solar Terrestrial Relations Observatory (STEREO). [Friday, October 20, 2006] "NASA can do even better in partnering with the commercial and entrepreneurial space sector in carrying out our nation's Vision for Space Exploration." [Friday, October 20, 2006] "The purpose of this Agreement is to establish collaboration between the Parties to conduct the Lunar Lander Analog Vehicle Challenge, a technology demonstration competition resulting in monetary awards to the winning participants." [Friday, October 20, 2006] "We conducted research with the chip while we were flying in parabolas, going from two times Earth's gravity to zero gravity again and again. There is absolutely no way this experiment could have been done without this chip." [Sunday, October 22, 2006] 20 October: "After a week of qualifying activities and lots of work, the space elevator games opened at the X-Prize Cup today. Six teams qualified for the climber competition though it is possible that another may qualify tonight." [Monday, October 23, 2006] The National Aeronautics and Space Administration (NASA) is proposing to amend part 1266 of Title 14 to update and ensure consistency in the use of cross-waiver of liability provisions in NASA agreements. [Wednesday, October 25, 2006] "FAA believes it has minimized compliance costs by basing its regulations on common safety standards and has allowed for flexibility by taking a case-by- case approach to licensing and by providing waivers in certain circumstances." [Tuesday, October 31, 2006] ESA will be hosting the �ISS Research Technology from Europe� Industry Day on 7 November 2006. The event is open to representatives from industry involved in the development and installation of European ISS research technology, and for interested media. [Tuesday, October 31, 2006] XM Satellite Radio today announced the successful launch of its XM-4 satellite. Liftoff occurred this evening at 6:49 pm ET from the Sea Launch Odyssey Launch Platform in open waters of the Pacific Ocean on the equator.